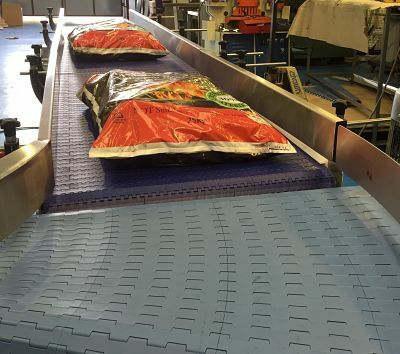 C-Trak manufacture Bulk Handling & Automated Packing Conveyors that can incorporates Bag Kickers to sack handling. Let us help investigate and diagnose any problematic areas that can be improved upon. This will depend on your individual application but rest assured we have been designing and fabricating conveyors for nearly 4 decades and can incorporate turners and metal detection units into your existing machinery with little down time. Look at some of our solutions. If you need a system for your sorting / packing area or assembly line in your warehouse then a heavy duty conveyor can transport and rotate your products efficiently with little or no maintenance. C-Trak has developed a brand new speedy concept of a Bag Kicker handling up to 30 bags a minute and will turn up to a 32kg bag. How do Bag kickers work? Our kickers have been designed to be user friendly and supplied with a fully adjustable striker plate which has a unique designed fully adjustable cross bar. It comes complete with an internal control system interlocked for safety reasons. The customer only needs to attach compressed air. The frame is fabricated in Stainless Steel making it suitable for the food industry including drinks and pharmaceutical companies. C-Trak can integrate one of our bag kicker into existing production lines installed with minimum of down time to your production. Providing innovative production & process handling solutions in all types of industries. Paying attention to design. This video shows a modular belt conveyor carrying 2 off one ton bags in short length units with close transfer to move the bulk bags once they have been filled around the factory floor with ease ready for pick up. It can be supplied with stop start buttons along the length of the system. Always at the forefront of technological with over 37 years of experience in the conveying industry using the most up-to-date software on solidworks offering our customers 3D images of there conveyors. All of our systems are fabricated to stand the test of time and our after sale service is offered with a friendly team to help with any queries.